This is a reasonable question to ask someone who is going to poke you with sharp things in the name of helping you feel better. In fact, I was just asked this question last week by the mechanic when I took my car in for an oil change. He told me how he had been in an astonishing FIVE car accidents in his young lifetime. This guy had been through years of physical therapy, but continued to live with chronic low back pain. He admitted to me that he had heard acupuncture was great for pain, but had not tried it because he was afraid it would…..you guessed it..HURT! I said to this young man “Well, it does not usually hurt, but it depends.” Surprise! I bet you thought I was going to tell you that acupuncture is always completely pain free. The truth is that themajority of the time acupuncture is painless, but there are some situations where there may be brief discomfort. I’ll explain in more detail in a minute. Why Do People Assume Acupuncture Will Hurt? Most people think that acupuncture will feel similar to getting your blood drawn, or getting a shot or injection of some kind. However, it’s nothing like these procedures. To start with, the equipment is totally different! A blood draw or injection needle is hollow at the tip, and is MUCH larger than an acupuncture needle. This type of needle is usually quite inflexible and does not bend when pressure is applied. Example of what a standard injection syringe looks like. Average size is about a 25-27 gauge or 0.5 to 0.4 mm. These needles are much larger than acupuncture needles. An acupuncture needle is not hollow, and is TINY compared to other medical needles. It’s so tiny, it’s about the size of a kitten whisker. The size puncture that is made by an acupuncture needle is so small that it very rarely causes any bleeding when it is removed. If it does cause bleeding, it is usually 1-2 small drops that is stopped with brief pressure with a cotton ball, no bandage necessary. 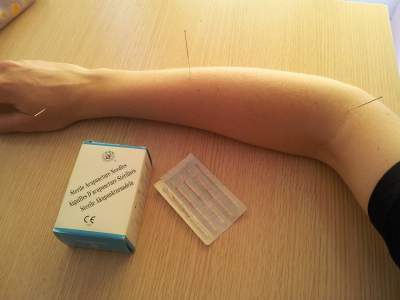 Example of sterile acupuncture needles when inserted. They are so thin and flexible, and come in sterile, single use packaging. Acupuncture needles are inserted in a different manner than a blood draw or injection. The insertion process is done very quickly. It only takes a fraction of a second for the needle to pass through the skin, and into the muscle beneath. The insertion is often done with the assistance of a sterile guide tube, that helps the practitioner place the needle in a specific location, and then quickly tap the needle in. Most of the sensors in your skin that register pain are in the first couple layers of the skin. Once the needle is through those layers, your body does not register this as a pain sensation. The pain is about the level of a mosquito bite, and lasts about one quarter of a second. Occasionally if an area of your body if acutely injured, or very painful when you come in, the needle insertion might feel a little more tender. I would rate this tenderness to the feeling of a mild bruise. There is usually relief of this tender sensation within 15-30 seconds of the insertion, followed by a lessening of the soreness in the area. What happens once the needles are in? Once the needles are inserted the treatment is quite comfortable. You are often not even aware of the needles once they are inserted. Needles are retained in the body for anywhere from 10-40 minutes depending on your specific needs. Most people report feeling deeply relaxed during this time, and it’s quite common to drift off into a short nap (BONUS!) This relaxing effect is achieved through mechanisms such as the up-regulation of endorphins and beta-endorphins (your body’s natural pain relieving substances), and an increase in the production of serotonin and GABA (two neurotransmitters that help us to feel calm and happy). At the end of your treatment the needles are gently removed and discarded. The removal is completely painless, and there is very rarely any bleeding or bruising where the needles where placed. Occasionally you will feel a mild itch where the needles were, and this subsides within 30-60 seconds. Acupuncture is almost completely painless. The benefits are worth it for the following reasons. The pain relief and benefits that most people experience from acupuncture far outweigh the few seconds of mild discomfort. Every new patient we have treated has responded to their first treatment with something to the effect of “That was nowhere near as uncomfortable as I expected to be.” Most wish they had tried it sooner! We hope you find this helpful if you’ve been on the fence about trying acupuncture for fear of discomfort. 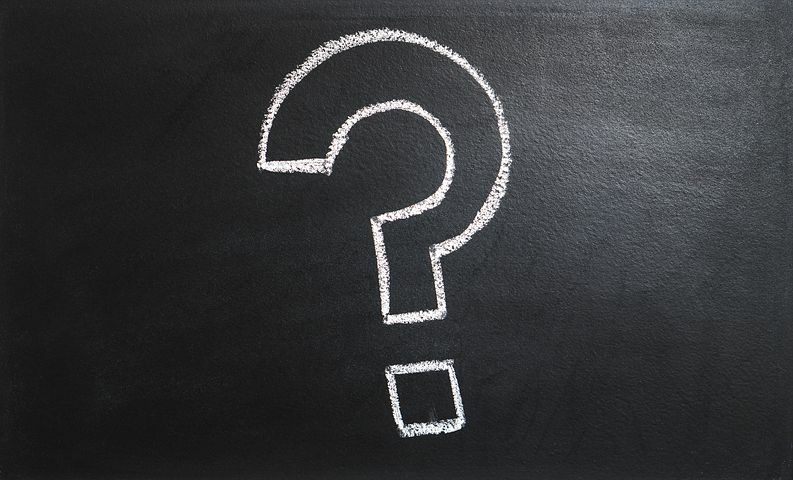 What are some other things you’ve always wanted to know about acupuncture, but maybe were afraid to ask?